More info:Nine overnights - Luggage transfer- GPS data-No taxis- 700 Euro total fee per person on a double occupancy B&B basis, with five dinners included. 1,130 Euro - total fee per person when a single traveller on B/B with eight dinners included. Buildings : The Pilgrimage Walk passes through a large number of Cyprus villages, many with preserved traditional architecture (eg Episkopi Morou Nerou, Kelokedara and Trachypedoula - or Salamiou - , Arsos, Omodos, Mandria, Pelendri, Palaichori, Gourri, Fikardou, Pera Orinis). We see the Pilgrimage Walk as a celebration of our rich history, cherishing the use of locally found materials by our ancestors in the construction of village houses, churches and monasteries, medieval bridges and watermills. We love to share our cultural heritage with travellers and thus enrich their experience. We envisage that a better appreciation of traditional architecture will lead to conservation and restoration. Specifically to this trip, we are making efforts towards the repair of a medieval bridge between the village of Potamitissa and Pelendri. We are happy to say that the restoration procedure has now started and looking forward to presenting the bridge and hopefully including it on our route once the repair work is finished. Transportation: We are happy to say that the Pilgrimage Walk is one of the walking routes that we offer where there is NO need to use transportation other than one’s legs. We strive to minimise as much as possible the use of transportation on our trips because this would be in the interest of the environment in general and of our clients in particular since this is reflected in a lowering in the price of the package. For travellers who may need transportation, we provide public bus information and encourage the use of local public transportation if needed. The Pilgrimage Walk traverses several rural communities, many of them with minimum (yet adequate) amenities. All accommodations and restaurants that we use (even in very touristic Paphos) are small family run establishments, which means that the Pilgrimage Walk helps pump income directly to the local communities. (Except for Paphos where there are many choices, so we include no dinner in the package) Dinners are prepared and served by locals; this adds another degree of authenticity and character to the experience of travellers, who have the chance of tasting home cooked food in villages on the island of Cyprus. The financial benefit of the Pilgrimage Walk gives an incentive to the wider community to conserve their heritage. The Pilgrimage Walk is a modern route through rural Cyprus having deep roots in a traditional pilgrimage through the centuries to Apostle Antreas monastery (which was extraordinarily also done by Muslims). Our services are about authentic experiences, and cultural heritage is a huge element of these. Local cuisine is a living component of Cyprus rich cultural heritage, reflecting the intermixing of a number of civilisations that came to the island. We mainly provide Cyprus cuisine to travellers because besides being authentic, we consider it of high quality. 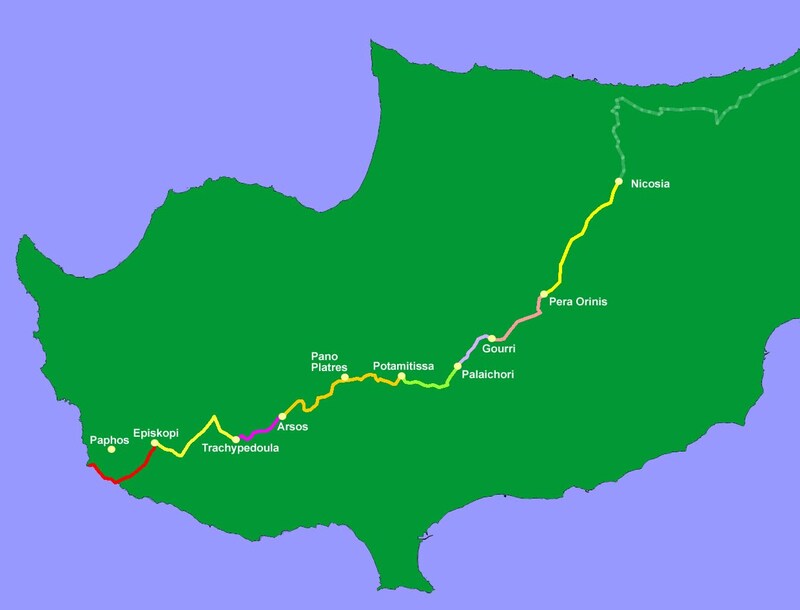 The Pilgrimage Walk passes through vineyards, olive groves and other traditional cultivations of Cyprus. The island has a long wine history and indigenous grape varieties not found anywhere else (like Xynisteri, Maratheftiko and Spourtiko). There are a number of rural wineries on the Pilgrimage Walk and travellers have the opportunity to visit a number of them (eg at the village of Arsos, Omodos and Mandria). Visits to local wineries in turn benefit the wine makers and provide them an incentive to continue to cultivate the ancient vineyards and produce quality wine.